What time is a good time to be up to no good? When's the best time to fight dark forces? Our answer: anytime is a good time. This thing is any good mischief requires coordination. 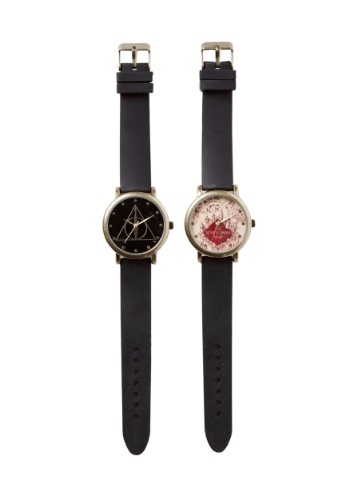 Whether you're solemnly swearing to be up to no good or you're swearing to fight for good you'll be on top of the schedule with these two snappy watches. These watches have a basic black band with silver clasps and seven adjustments for size. The face of the watch is encircled with a brassy setting. 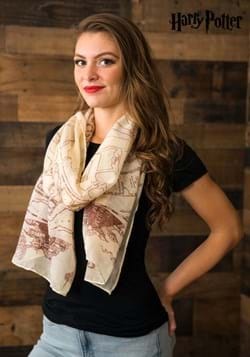 The Marauder Map has gold number placements around the face with the red map illustration. The Deathly Hallows watch has a black background and the Deathly Hollow insignia. Both watches have a golden second, minute, and hour hands. Both watches have a notch on the side to adjust the time. Whether it's time for mayhem or action you'll be ready with these two watches, it's time to be up to no good! Standard Wrist Size Approx. 12" Approx. 12"